Greek Default Watch: Is Leaving the Euro Good for Greece? This is a fair question. I have never been an unqualified supporter of Greek participation in the euro. The benefits that Greece enjoys as member of that currency union, a country can enjoy outside of it. And there are significant costs as well to Greece having the euro. Sensible people ought to look at both. In the euro, Greece loses control over monetary policy, which means it cannot print money. In turn, this means that it follows the Eurozone monetary policy and that its exchange rate is fixed relative to its Eurozone partners. How important is an independent monetary policy, and how important is exchange rate flexibility? In normal times, monetary policy can anchor inflation expectations; when markets do not fear that governments will print money to finance deficits, they expect lower inflation. Given that high inflation erodes wealth, undermines investment and impedes transactions, low inflation is a great gift. As John Maynard Keynes wrote, “Lenin is said to have declared that the best way to destroy the capitalist system was to debauch the currency.” In tough times, monetary policy can also make credit available when the private sector needs it, helping to smoothen the business cycle by shortening the trough. This is the theory; what about the practice? In fact, Greece saw a secular decline in inflation. In the 1980s, its inflation was 19.5%, but from 1992, as the country began the process to join what eventually became the euro, inflation fell and reached a low point of 2.6% in 1999. In the 2000s, Greece still experienced lower inflation, averaging 3.2%. Even so, that inflation was still high relative to its peers: 2.1% was the inflation rate in the Eurozone. This mismatch brought about two effects. First, it meant that monetary policy was too loose – nominal interests are set commonly but real interest rates depend on country-specific inflation. Higher than average inflation meant lower than average real interest rates, which led to excessive borrowing. To be fair, Greece’s borrowing binge was caused by a structural mismatch between spending and revenue rather than opportunistic spending due to cheap credit. But cheap credit did not help restrain spending. Second, higher than average inflation misaligned domestic with international labor costs. Greece buys and sells goods using the euro, but because Greek prices and wages were rising faster than European prices, Greek labor costs grew out of synch with the rest of Europe. Relative to 2000, unit labor costs in the Eurozone were up 27% in 2008; in Greece, they were up 62%. This is the highest internal misalignment of any member of the original Eurozone (Slovakia and Slovenia are worst, but they adopted the euro later). There was one more benefit that came from the euro: Greece’s borrowing costs fell. From bond yields that were three times as high as Germany’s in the early 1990s, the two cost of borrowing for the two countries was almost identical by 2001. Three reasons explained this. 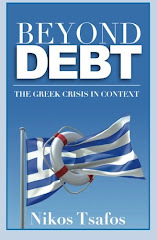 First, as Greece puts its finances in order to adopt the euro, its borrowing costs should fall. Second, creditors faced no currency risk if they were fellow euro members or reduced currency risk if they were not (assuming that the Greek drachma would be less stable that the euro). Third, there was a broader convergence in bond yields in the Euro area – although in theory, debts are national debts, the market treated them as collective debts, at least until 2008 (in retrospect, at least for Greece, they were right – Germany did pick up the tab). All together, this is a strong case for exiting: fiscal consolidation requires export-led growth; Greek inflation was anchored at first but soon exceeded the Eurozone average; exchange rate stability brought a misalignment in labor costs; and finally, Greece no longer borrows on the coat tails of Germany since the spreads against German bonds have ballooned. So why stay in the euro? This is a sensible case but ultimately a flawed one. For one, inflation and borrowing costs might seem misaligned now, but they are miles ahead from where they were in the early 1990s. It is quite easy to foresee that outside the Eurozone, Greece could spend a decade coping with double digit inflation rates. And borrowing costs will start reflecting both credit and currency risk, compounding the country’s debt and deficit troubles. Life may seem hard in the euro; it would be much harder outside of it. What about the exchange rate; won’t Greece grow faster without the euro? My main objection is that people who say that Greece will grow faster with a devalued drachma have decades’ worth of evidence against them. A weak currency in itself is a poor foundation for export-led growth. Greece had a free floating drachma before the euro but with no export-driven industries to show for. Just becoming cheaper only gets you so far. Take tourism. Greece is losing out not only because it is becoming more expensive (it is) but because its product has not evolved. My parents (who are in tourism) tell me of clients who say, “If I come to Greece, I will go to the same hotels, the same museums, and the same clubs that I went to forty years ago; why come again?” Even in my lifetime, it is easy to see how places like Kuşadası in Turkey have been transformed while Mykonos, Santorini and Crete are offering the same product they did 15 years ago. My point is that there is a lot more to exports than an exchange rate. This brings me to point number two. Anyone who is familiar with the Greek economy knows there is plenty of slack in the system, courtesy of rigid labor markets and red tape. There are businesses that are not created, products that are not launched, and services that are not offered because there are too many barriers in the way. It rarely pays to try big things in Greece. This is where Greece’s growth should come from – and it is Greece’s reform challenge. Export-led growth through a devalued drachma is anathema to Greece’s real reform challenge. It’s a shortcut to growth, and a fake one at that. It treats the symptoms – higher inflation and higher labor costs leading to lost competitiveness – rather than the illness, which is a structural gap between spending and revenues coupled with an environment that destroys free enterprise, innovation and risk-taking. A devalued drachma could possibly help with the recovery – but if it undermines the reform agenda, if it makes Greece cheaper but not better, then it is a bad idea. And Greece has had enough of bad ideas.